The promise of extraordinary brain power isn't fulfilled. 96 min. DreamWorks. Director: Tom McGrath. Cast: Will Ferrell, Tina Fey, Brad Pitt, Jonah Hill, David Cross, Ben Stiller, Justin Theroux. DreamWorks Animation conjures up its history of conceptual rip-offs with the sometimes diverting, sometimes dull Megamind. Luckily, kids have short memories, but it's still no sure bet they'll respond to the latest animated entry in the post-ironic Shrek vein. Those of us who remember the bad old days when exec Jeffrey Katzenberg jumped ship from Disney to DreamWorks may wonder if Megamind is the result of the same kind of corporate espionage that pitted Antz against A Bug's Life, The Road to El Dorado versus The Emperor's New Groove, et al. Though Disney isn't involved this time, Megamind bears conceptual resemblance to Despicable Me, released in July by Universal. Hard to say which went into production first, but both take a supervillain's perspective, as we discover he's not such a bad guy after all. Will Ferrell plays the dastardly doofus Megamind, the perpetual loser of epic matches with superhero Metro Man (Brad Pitt, amusingly channeling buddy George Clooney). Always drawn into the middle, reporter Roxanne Ritchi (Tina Fey) fills the Lois Lane role. As written by Alan J. Schoolcraft and Brent Simons, Megamind trades on the mythology of Superman, beginning with an origin sequence that finds baby Megamind and baby Metro Man hurtling away from exploding homeworlds (the most amusing riff: Megamind adopting the guise of a fatherly mentor with a distinct resemblance to Marlon Brando's Jor-El). The orderly world of Metro City goes topsy-turvy when Megamind appears, almost accidentally, to vanquish Metro Man. What is a supervillain without his hero? This question, at times addressed seriously in the pages of comic books, gets a comic treatment—or, rather, a "romantic comedy" treatment as Megamind attempts to win over Roxanne, for whom he's long carried a torch. The story's loose parameters of good and evil put forward the hopeful ideal that everyone is capable of redemption or, in the case of Roxanne's cameraman Hal (Jonah Hill), corruption. Granted super-powers by Megamind, Hal becomes Tighten, a would-be superhero whose selfishness quickly turns him villainous. Early on, Megamind explains, "Being bad is the one thing I'm good at," but his buyer's remorse when he gains control of Metro City teaches him that love is all he needs. It's all very silly, and even more busy, with the focus put squarely on bells and whistles. Detailed design and swooping "camera" work exhaust the eye while ironic infusions of pop music exhaust the ear (the go-to method for easy laughs or spackling over deficiencies of plot and character). Director Tom McGrath (Madagascar) lands a few of the jokes and gets good results from his voice cast, including the reliably off-kilter David Cross as Megamind's pet fish Minion. Say this for Megamind: it doesn't lack energy. Nevertheless, the promise of extraordinary brain power isn't fulfilled. 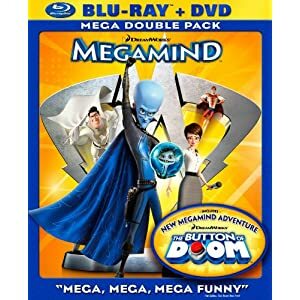 Dreamworks sends Megamind back into action in a Blu-ray + DVD combo pack special edition. Breathtaking color is the strong suit of the Blu-ray transfer, and impressive detail creates that hi-def illusion of depth. Surprisingly, the image isn't perfect, as it suffers from a serious case of the "jaggies" (a.k.a. noticeable shimmering where it shouldn't be). Compensating for that misstep is a truly awesome lossless Dolby TrueHD 7.1 mix that presents a powerful and delicately balanced soundfield. Dialogue is always well-prioritized, and the discrete separation of audio elements expertly creates a lively and immersive soundfield. The bonus features begin with a filmmakers' commentary by director Tom McGrath, producers Lara Breay and Denise Nolan Cascino, and writers Alan Schoolcraft and Brent Simons that's also available as part of the PiP video commentary The Animators' Corner (HD): The Animator's Corner shows the commentators as well as storyboards, pre-viz sequences and brief behind-the-scenes featurettes that skip over the commentary. Another playback option is a Trivia Track. Many will hasten to the all-new animated short "Megamind: The Button of Doom" (15:22, HD), a slam-bang adventure in which newly-christened hero Megamind must take on a robot formerly of his arsenal. Comic Creator (HD) enables fans to doctor nine comic-book scenes, using a variety of options. Behind the Mind (HD) is a sort of conceptual gallery, with sections for Hideouts, Inventions, Vehicles, and Megamind: Good & Evil. "Meet the Cast of Megamind" (9:26, HD) takes us through a roll call of the film's actors, who comment along with the filmmakers. The "Deleted Scene" (1:36, HD) here is the amusing outtake "The Toothbrush Scene." "Inside Megamind's Lair" (7:17, HD) examines the designs of Megamind,. Minion and their surroundings. "AnimatorMan" (2:01, HD) briefly introduces us to the animators. "You Can Draw Megamind" (13:14, HD) allows story artist Andy Schuler to demonstrate how to draw everyone's favorite character. We also get the odd little music video "Mega Rap" (1:01, HD), The Reign of Megamind -- Video Comic Book (HD), the detail-oriented game Spot the Difference (HD), World of DreamWorks Animation interactive A/V gallery (HD), and previews of DreamWorks-related films and products. All site content © 2000-2019 Peter Canavese. Page generated at 04/18/2019 02:47:41AM.